These fit great, I’m a size 10.5 in shoes(size 11 in narrow shoes), I got these blades in size 10 and their perfect! Their extremely comfortable with lots of cushion. The strap is quick and easy to put on and take off while staying the same size you choose without getting loose. The Soul Plate is very durable and wide, but not too wide. Even the negitave side has decent width and both sides are smooth for grinds. The Boot is so durable and tough, and the colour is eye catching and matches with anything. 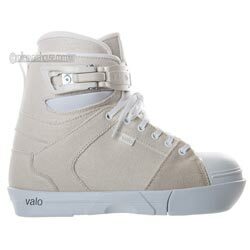 Skate them hard and have fun, these will take the beating and fell great on your feet, I highly recommend this boot!